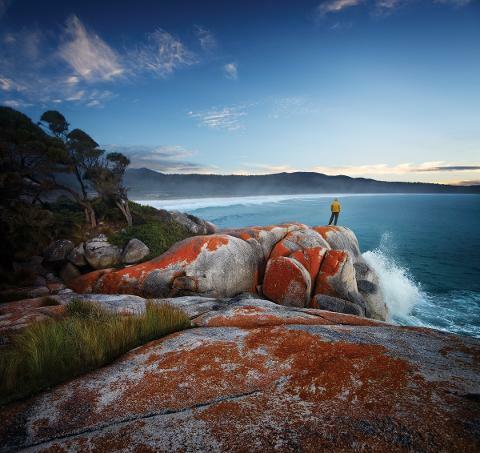 This diverse national park sits on the east coast near the gorgeous Bay of Fires and the coastal town of Bicheno. The area contains one of the only uncleared dry forests on the island, so you'll find many endangered species that only live here. You'll also find a fantastic river gorge full of hidden swimming holes as well as eucalypt forests, a dolerite plateau and heathlands. These pockets of contrast make for a beautiful escape to one of many swimming holes during hot summer months. And, yes, it's worth skipping the picturesque beaches of the east coast just for a day. An unsealed road from the Tasman Highway between the towns of Bicheno and St Marys takes you into the park. You'll find an unmanned pay station for entry into the park where you can purchase a day or holiday pass. Launceston, sitting 135 kilometres to the west, is the nearest big city and a drive will take you two hours and 30 minutes. A drive up the coast from Hobart spans 204 kilometres and will take you three hours. Devonport is 217 kilometers to the northwest and that drive will take you three and a half hours. The park is about 100 square kilometers, but this medium-sized park contains many different regions of flora and fauna. Douglas-Apsley National Park is full of wonderful walking trails that vary from flat, easy walks to challenging overnight hikes. Some highlighted trails are the Apsley River Watering hole; an easy walk that takes you to a very cold and very famous swimming spot. The Apsley Gorge Walk takes about three hours over five kilometres up to a ridge before descending into the gorge where you can find tranquil pools perfect for a picnic. And the Apsley Myrtle Forest walk takes you on a 45-minute loop through the last remaining dry forest in Tasmania. Hiking in the more remote north end of the park is worthwhile but there are no facilities and a detailed map is a must. Swimming is a popular pastime in the park. The Douglas-Apsley National Park is split by the Douglas and Apsley Rivers. These waterways carve out riverbeds and gorges through the park that are ripe for exploring. When the air is hot, the water is cold; really cold, and it's perfect for a cool-off. Just beware that the water running through the park supplies Bicheno with its drinking water. Do not use any soap or detergent and dogs are not allowed in the park. The park's two rivers, Douglas and Apsley, rise to create marshlands in the west of the park. The rivers then drop down to cut gorges in the eastern section of the park where you'll find beautiful waterfalls, cascades and secluded swimming holes. Nicholas Needle, a towering dolerite spire, rises nearly as tall as the highest point in the park -- Lookout Hill. The 640-metre hill gives you panoramic views of the park as it rises above forested terrain. The dry forest contains white peppermint, Tasmanian blue gum, gummed-topped stringybark, barbers gum, Tasmanian ironbark, South Esk pines and Oyster Bay Pines. The park contains a dolerite capped plateau next to dry eucalypt forest, pockets of rainforest and colourful heathlands. You're never too far away from a different type of terrain which makes the overnight Leeaberra Track all the more diverse as you'll explore most of the lands the park has to offer. You'll find most of Tasmania's marsupial population wandering the park at dusk. From wombats to wallabies, these creatures are nocturnal. So, if you're not camping overnight, you're unlikely to catch a glimpse of the forest kangaroo, Bennet's wallaby, the wombat or pademelon. The park has been designated an Important Bird Area by Birdlife International. It is home to 11 of the 12 Tasmanian endemic species of bird including the flame robin, pink robin and swift parrot. Wandering from one terrain to another with your binoculars should reveal some of these rare birds. 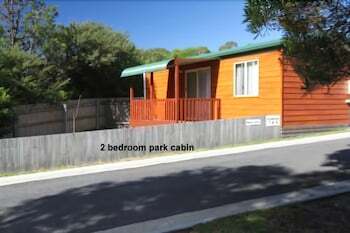 You'll find camping facilities near the famous Apsley Waterhole walking trail. There, you'll find compost toilets but no other facilities. You'll have to haul your own water, food and shelter. For those intrepid hikers walking the Leeaberra Track, you'll find rustic campsites near Heritage Falls, Tevelin Falls and the Douglas River. The dry forest of the Douglas-Apsley National Park somehow survived the early economic booms of Tasmania's past that relied on copper smelting, cattle grazing, fur trapping, coal mining and timbering. There were plans to timber the entire area clean back in 1987, but the region was saved by a new government in 1989. The Labor and Green Parties joined together to designate the area for conservation, and, later, declare it a national park. The move saved the natural habitat for rare and endemic bird species, the drinking water for the town of Bicheno and multiple terrains for eco-tourism. Not to mention the many pristine swimming holes along the two rivers. 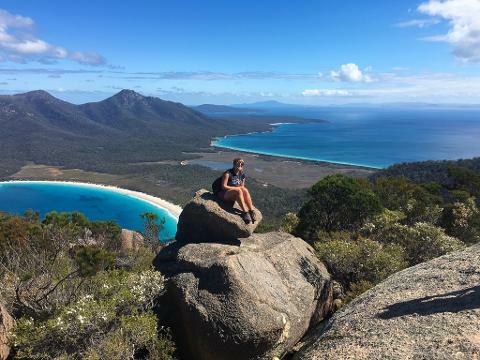 3 day walking experience on the beautiful Bay of Fires on the east coast of Tasmania.